CQ Magazine’s Worked All Zones (WAZ) is one of the oldest, most prestigious and highly sought after awards in Amateur Radio. Their 40 zone dicing of the world is not the only way to carve up the Earth’s landmass. The International Telecommunications Union (ITU) does the same thing with the planet using their ITU zones. Back in the day I could not find an established award to shoot for while piling up ITU zone multipliers in the IARU HF Championship until I found John Lee’s (K6YK) ITU Zone Award. 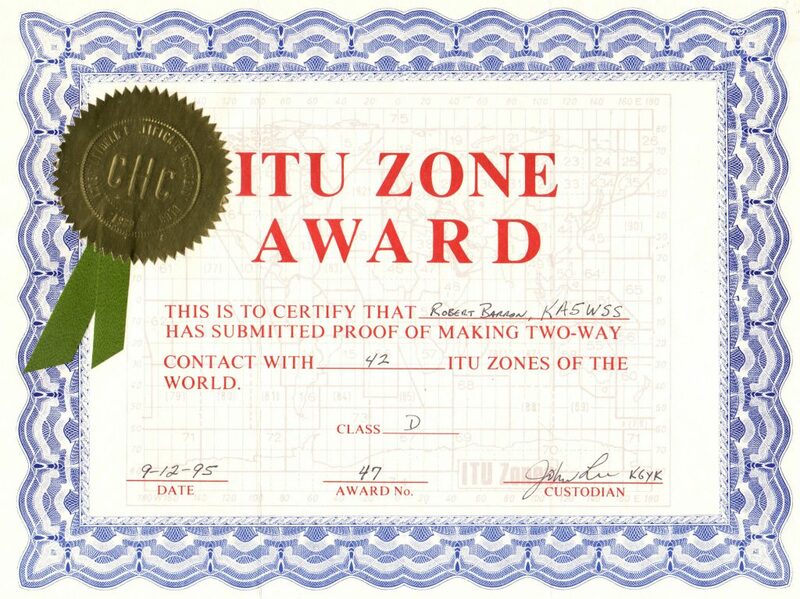 The class D certificate required a minimum of 40 ITU zones. I like the old school touch of this award with the physical ribbon and embossed seal. There are 90 ITU zones in the world and some cover only water, so an award that requires confirmation with all of them would be a supreme challenge. Luckily this award broke things out into classes with the lowest level award requiring 40 ITU zones. To obtain the lofty AA class you’ll need to work a number of maritime mobile stations. John still supports the award. For more information on how to apply contact him via email as can be obtained from the qrz.com website. Award applications should follow the GCR standards, so you’ll need two licensed Amateur Radio operators to confirm receipt of your contact confirmations. As of 2019, the cost of the award is a very modest $5.00. Endorsements are available for $1.00. Updated: This post was updated on 4/1/2019 with information provided by John himself in his comment below. zones. Maritime mobiles do count (some zones are all water). Verification of a list of QSOs indicating date, call, band, mode and Zone No. will be accepted. GCR Rules apply. Basic award fee $5.00 postpaid. Endorsements $1.00. There is also a VHF award. E-mail for particulars.